What I eat in a day varies whether I've got school or if I'm training etc. On this particular day I stayed at home. Every morning I drink water before eating, it's important to hydrate your body after sleep. It also can boost your metabolism by 24%! Click here for a review on my favourite water bottle tracker. Today I had oatmeal with sliced bananas, desiccated coconut, chia seeds and almonds. Three multigrain rice cakes with peanut butter and chia seeds. Chocolate protein powder, banana and almond milk smoothie. Chicken and ham salad (lemon & honey as dressing) sprinkled with chia seeds. Brown rice with soy sauce, salmon and vegetables. Throughout the day I consumed water and green tea. 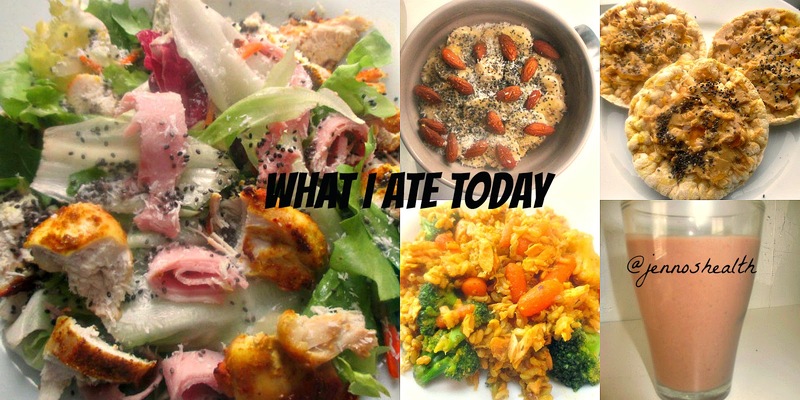 What did you eat today? Did you enjoy this post? "I like food. I like eating. And I don't want to deprive myself of good food."